Last year, The Franciscan Well brewery in Cork released a stout that they aged in Jameson Barrels. It was a limited release of 900 and not very official. I think I bought 6 of the 1 litre bottles, one for Steve Lamond and I have two left. It was lovely but I don't think I have written about it yet, well; not the bottled version. I think that's me dropping the ball as they say. I probably say to myself that "I have more bottles left, I'll just drink this one and take notes next time". Anyway, never fear because TheBeerNut wrote about the original version. Anyway a year on and the project has been released again. There are some differences though. Earlier in the year, The Franciscan Well was purchased by benevolent brewing giant: Molson Coors in a move to secure an Irish presence in their range of Craft Beers. Having done the same in the UK with Sharp's and Worthington's with no downsides I can see, the move has some people divided. On the one hand, we are delighted for the brewery who, with the help of Molson Coors, will be expanding to a new brewery and getting the product not only around Ireland, but probably the world. The downside is that we have lost an Independent Irish brewery but these days that's not much of a problem because already another brewery has opened in Cork and there are many more opening up this year and in to next year around the country. Molson Coors is pushing their Craft Collection on pubs, a complete craft beer package of Blue Moon, Worthington's, Sharp's and Franciscan Well. It's great news for choice in Ireland, especially if they get pubs that don't stock craft beer to take it on. With the marketing power of MC behind it, the Craft Collection will initially be met with suspicion from the brand loyal Irish in their local, to accepted after the marketing power tells them it's OK. Look at the likes of Coors Light, I remember when that first appeared and no red blood Irish man would be caught dead drinking a light beer. How things have changed. Anyway, when the brand loyal and suspicious drinkers become used to these strange new beers, they might be a little more willing to branch out. My only concern is that some pubs might take the Craft Collection instead of, or even replacing other Irish Craft Beer. I see no real evidence of that happening but I'm sure it will at some point, though probably not at the behest of MC themselves. I know I'm rambling somewhat, I apologise for that. The other difference is that this time around, the release is more official like (in your best Cork accent). This time Jameson is a little more involved and they were present for the launch on Monday evening. When I walked in, I was greeted and given a cocktail. I was told it was something with Jameson select reserve in it and ginger ale. Personally I thought the Jameson was wasted in the cocktail because it reminded me of cold lemsip mixed with dioralyte. So lemon and salt really. I'm not a cocktail sort of person, at least not any more. I wasn't quite so blunt to the lovely people from Jameson though, other than to say I would rather just the whiskey. They went off and got me one and it was absolutely fantastic, especially alongside the bacon jam canapés. This gave it a sort of Scotch feel and it was a match made in heaven. Eventually it was time to eat and drink the beer in question. All three courses had been designed to match the stout but for me, the oysters were by far, the best pairing. The oyster and stout flavour staying with you long after you were finished. 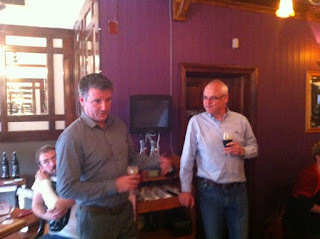 Our hosts, Shane Long from Franciscan Well and Dave Quinn from Jameson; got up to give us the expected spiel. Shane refused to give actual tasting notes and encouraged us to do that for ourselves. Here are the official tasting notes though, I have very little to add to them so they will do. The beer is lovely but the real question is, how does it compare to the original version? I'll do a side by side later in the year. That will make the Original about a year old and the new batch about 6 months old. Flavour: Smooth, dry on the palate with a rich dark chocolate/coffee at the front and a very subtle whiskey warmth at the back. Finish: Rich and roasty, with a subtle hint of warmth from the whiskey and a tiny bit of vanilla from the oak cask. Pouring Ritual: To enjoy this particular beer at its best it should be poured at 10°C. Too warm, and the whiskey flavour tends to overpower. Too cold, it can kill the whiskey flavour altogether. We recommend keeping in the fridge until about 30 minutes before opening. It’s certainly worth the wait! Food Pairing: This smooth, rich stout deserves to be served with something equally smooth, rich and delicious. I would like to thank our hosts, not only The Franciscan Well and Jameson but also WJ Kavanagh's for putting together a lovely menu to complement the beer. The beef shortrib was soaked in Shandon Stout, the little brother to the Barrel aged version. There may have been stout involved in the chocolate desert too, I don't recall. I should have kept a menu. Still yet to try that and the original stout! 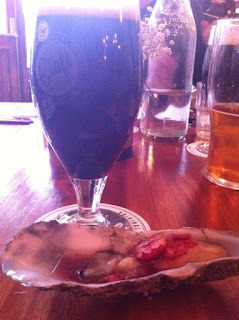 Ultra drool on that oyster and stout beerporn- is that oyster massive or is the glass small because they seem about the same size. Can one comfortably drink beer out of oyster shells?! Nirvana tasting session. The glass is a half pint stemmed glass. The oyster was big but not massive. Any indication as to when this should hit the good offy's? Also is there any chance of a comparison between it and the newer O'hara's barrel aged stout? Celtic whiskey have that in stock at the moment. A side by side request? I think I can accommodate that. Sounds like just the sort of thing I enjoy doing.